Michelin Energy MXV4 Plus tires are a grand touring all-season tire made for sport coupes and luxury performance sedans. They meet the Michelin Green X Standard with lower rolling resistance, which confirms the contribution the tire makes to reduce fuel consumption emissions of CO2 gasses. This tire is designed to give you a very high level of comfort along with a longer tread life. They are also an all-season tire providing traction in dry, wet, and even light snow conditions. The Radial XSE Technology developed by Michelin features a smart tread compound, optimized mass distribution, and optimized casing shape. With the combination of this technology and the use of silica-based rubber compounds, the tire will resist wear better, hold on the road better, and improve the overall fuel economy of your vehicle. Michelin molds this compound into a symmetric dread design with diagonal intermediate blocks for better flow and a quieter ride. The inside of the Michelin MXV4 features BAZ technology giving the tire a reinforced design for more durability. It also features a twin steel belt design to give more strength and stability at higher speeds, as well as a more comfortable ride. Overall, the Michelin MXV4 Plus makes for a good choice in a touring all-season performance tire. It has balanced traction and handling regardless of weather conditions, and the tire is quiet and comfortable as you would expect. Prices on the Michelin Energy MXV4 Plus tires start at $185 for 17 series tires and go to around $265 for the larger series models. Cut your cost with Michelin coupon below, or find other discount tires coupons here. Who Are Michelin Energy MXV4 Plus Tires Designed For? 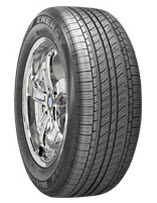 This Michelin tire is designed for the luxury sedan and sport coupe owner. They are made to last for a very long time and these tires are made to be used all year round. With the improved fuel economy they are also designed for the environmentally friendly car owner in mind. Michelin MXV4 tires are backed by a 6 year/45,000 mile tread life warranty with one stipulation; if the rear tires are a different size than the front they are only protected for half the stated mileage. The uniformity warranty is for one year or the first 2/32″ of wear. Materials and workmanship guaranteed for a full 6 years with free replacement in the first year or first 25% of wear. This is followed up with a prorated amount down to the last 2/32 inch of useable tread life. They also come with a 30 day satisfaction warranty and a 3 year flat changing warranty.